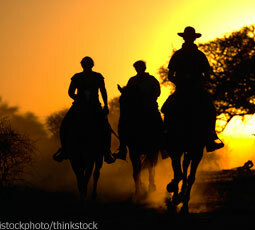 Check out the Internet and you will find horseback riding safaris in several African countries. Study their various agendas and decide if you want the full experience of living in a tent in the bush, far from the usual tourist routes with wild animals all around you; a more luxurious safari with boutique hotels, swimming pools and massages; or something in between. When to go on your safari will depend on the country you choose and whether it is their rainy season—not a time usually recommended. Your outfitter should be able to tell you the best months to book your safari, and what each time frame has to offer. Once you decide what you want, your most reliable source is a recommendation from a friend or acquaintance who has traveled with that particular outfitter. Websites may not tell the whole story and could paint a less than accurate picture of the safari, so always get a list of past clients you can contact for their opinions and experiences. There are many different riding safaris. Some offer an hour or two of riding a day with full-service luxury and time available for relaxing at the pool, shopping, winery visits and sightseeing. Others concentrate on the horseback riding with four to eight hours a day in the saddle, focusing on the people and wild animals in Africa. Those that cater to novice riders, and even have ponies for children, ride where there is no dangerous game, making horseback tours perfectly safe in these areas. Other safaris will only take experienced riders over the age of 16 but may offer game drives for non-riders. 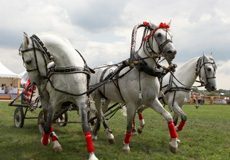 The more challenging safaris require riders to be proficient in all three gaits. And, in truth, if you don’t ride regularly before this type of safari, you will be very stiff and sore after the first day or two, making the rest of your vacation very uncomfortable. Another factor is required riding gear, which will include a helmet, riding breeches, half-chaps, riding boots and gloves for safety and comfort—a big expense if you don’t already have them. Some outfitters have some of this gear, such as half-chaps, available upon request. The outfitter we used for our trip, Safaris Unlimited, sent a clothing list and tentative itinerary of the days’ events, as well as a list of books to read before we embarked on our safari to acquaint us with Kenya and the Masai Mara. I definitely recommend some research before starting on your safari to help prepare you for your experience in the wild and wonderful continent of Africa. Great article. I want to go on a riding Safari! Oh, I would so love to do that!